SL Newser - People: Teachers Rock Second Life! 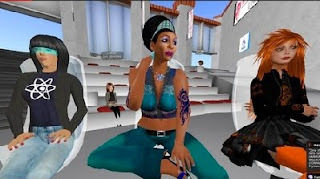 Education's cutting edge technologies are vigorously debated by some of the most vibrant groups in Second Life: Real Life Teachers! This meeting of Virtual Worlds Education Roundtable (http://www.vwer.org) was totally unplanned and yet tremendously interesting and informative free-form discussion. SL founder of VWER, AJ Brooks (SL), shares, "The most important thing to know about the VWER is that it is nothing without the community... most of our meetings take place with everyone sitting around a big roundtable and anyone has a chance to share... all are welcome – there is always a seat open." I attended a totally free form discussion at Montclair State CHSSSouth region. With no agenda at all, most SL groups would founder at such a totally unplanned event. With a thousand enthusiastic SL members, it's not a problem for VWER. Their online community is so strong that a simple announcement can gather large groups of enthusiastic discussants, ready to pave their own way toward educational excellence and group synergies. This discussion was wide ranging and, I thought, a very refreshing view of upcoming SL changes. For example the ending of educational discounts for land in SL did not seem to concern these educators much. For example, Marc Rexen commented: "Our first contract with WebCT was for just short of $500,000 or $15 bucks per head...most site-contracts are down at $1 to $2 per head, or much more (Campus Agreements with MS). Depending on usage, what LL wants for a sim is peanuts." Surprisingly, Second Life use for teaching is often questioned by students, and getting tech support for "the SL game" in schools is well nigh impossible. Those were major topics of discussion. You would think that children and young adults would "get" SL in a heartbeat, but not so, says educator Sheila Yoshikawa, "I still find it interesting that at the moment I'm having to give very clear accounts to my students about why we are using SL (they ask me, why) when they don't ask 'Why are we using blackboard?' "
What I found most encouraging is the educators' deep reverence for the SL platform. With so many other technologies and metaverses available now, the discussion sounded like SL was the only game in town, so to speak! SL (See iReport SecondLife is Not a Game!» ) Marc Rexen shares: "Distance Education, discussions, language training, trust and presence building, can really only be done here [in Second Life]...very few other venues, even video-conferencing, are as good." VWER founder AJ Brooks shared more: "We meet each week on Thursday at 2:30pm SL Time (US Pacific). Meetings have a variety of themes, different each week, usually more focused. We do actively explore non SL alternatives. VWER is an outlet for people to express their ideas and learn. Views of individual members do not reflect the official views of VWER." VWER meetings at Montclair State CHSSSouth region are in their Ampitheather: Montclair State CHSSSouth (128, 128, 2). One VWER member was concerned that quoting from SL public chat might be an ethical problem for the members. Perhaps inhibiting members views at future meetings. In general, public chat in SL, on sims open to all, is fair game (on the record) for quotations, with respect to the SL Terms of Service. I took a conservative approach, as I would with any private IM interviews and requested prior permission for members' quotes in this story. When the Board stops making the Lindens treat SL like a game, then we'll stop treating it like a game. But as long as they insist L have no value and that you don't own anything inworld (not even your own inventions), then they reduced themselves to an online version of Candyland. It's either a virtual world with all the good AND the bad, or it is not.